After a brief vacation from the Top 8, WoundCowboy faced off against ESL champion and fellow teammate SonicFox. The first match kicked off in style as both players fought as Pretty Lady Leatherface. Although Cowboy went down the first game, the set ended up tied 2-2, which resulted in both players going to their respective main characters. An astounding amount of patience lead to Cowboy closing out the set with a flawless victory. Gunshow and Hayatei are two of the few desperately fighting for any remaining ranking points in order to qualify for the Season 3 Finals. They each brought their best to the table, hoping to venture further into this week’s bracket. Despite Gunshow showing signs of life, Hayatei made quick work of him and took the set 3-0 to advance to the semifinals. Scar has solidified his spot at the Season 3 finals, and this week ForeverKing was on a mission to do the same. After quickly going down a game to Scar, King knew that there was no room for error if he wanted more ranking points for the finals. A surprise debut of King’s Acidic Alien resulted in a strong Game 2 to tie the set 1-1. However, Scar made a switch to one of the rarest variations, Hat Trick Kung Lao and advanced over ForeverKing 3-1. In Week 7, we saw WoundCowboy and Hayatei battle it out for the first time. With these two competitors being so close in ranking points, every round was a deciding factor as to whether or not they would qualify for the finals. Hayatei used the shift of momentum perfectly as he managed to take all three games, advancing to the Week 7 grand finals and earning precious ranking points. 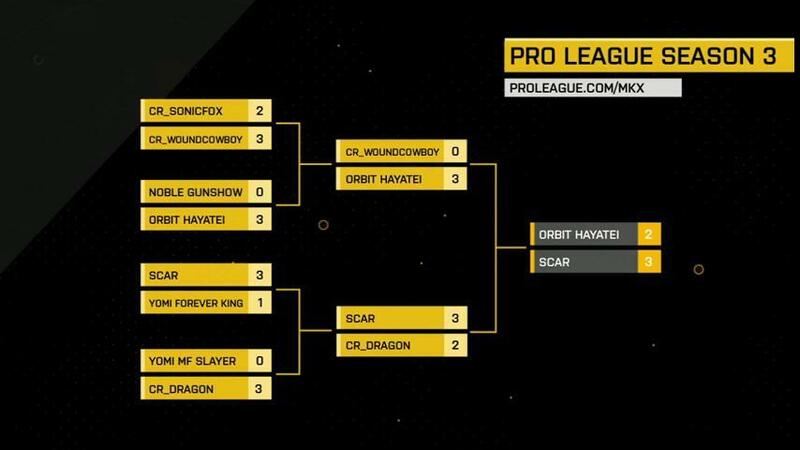 Scar and Dragon had also never fought each other in the Pro League before this week. Scar has been a force to be reckoned with this season and Dragon has been on a victory streak after winning 9 straight ESL events in a row. The set kicked off in familiar fashion, with Dragon taking the first game with apparent ease. However, Scar stuck with his Hat Trick Kung Lao and took the next game. After Dragon’s Alien was defeated so easily, he decided to make a switch to Assassin Kitana. The plan first seemed to fail as Scar took the lead 2-1, but a change of pace resulted in Dragon tying the set 2-2. As game 5 reached the last round, Dragon felt his win-streak slowly slipping out of his hands. With careful spacing and caution, Scar took down the mighty Dragon to advance to the grand finals. After an insane set of events, our grand finals consisted of Hayatei and Scar. While Hayatei is a Ronin Takeda specialist, Scar stuck with Hat Trick Kung Lao. Hayatei displayed some impressive matchup knowledge as he took Game 1. Scar quickly realized that his Kung Lao was not the answer. After some contemplation, Scar pulled out the second trick in his book, the Smoke variation of Triborg. Smoke’s mobility through pressure proved to give Scar the edge as he tied the set 1-1. Hayatei knew he needed to make adjustments to Scar’s different style of play as Smoke. In Round 3 of Game 3, Scar managed to keep a life lead for most of the round, but one false move lead to devastating damage as Hayatei took the lead 2-1. On the verge of elimination, Scar had one last chance to make a comeback. Although Smoke seemed to give him the most success, he switched to Covert Ops Sonya. What seemed like a questionable pick at first resulted in a genius move as Scar utilized the parry unique to this variation to halt Hayatei’s pressure. In Round 3 of Game 5, Hayatei was empty on meter. With this knowledge, Scar exerted brute force in the corner and locked Hayatei down. Despite all efforts to put up one last fight, Scar emerged victorious over Hayatei 3-2. While Fox, Dragon, Scar, and Raptor have secured their spots in the Finals, one week remains to determine the rest of our North American qualifiers. 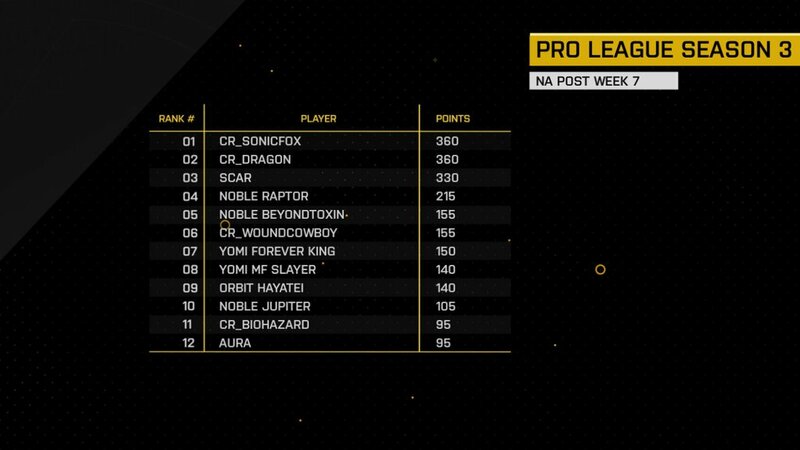 With so many of the competitors neck and neck in ranking points, Week 8 will either make or break their dreams of competing in the Season 3 Finals. Who will be our remaining qualifiers? Tune in next Wednesday, May 25 at 5PM PDT to find out, and be sure to grab your spot at the Season 3 Finals in Burbank, California while seats are still available! For all the latest information about the #MKXProLeague, follow ESL Mortal Kombat on Facebook and Twitter, as well as the official Pro League and Challenger Cup websites.